Draxis Review Goes on Safari!! Good day Draxis Web/Draxis Review readers! Some of you may know but for those that don’t I am very lucky to have a day job at Busch Gardens in Tampa Florida. To me, Busch Gardens is one of the best places to work because it takes two of my previous favorite jobs (Philadelphia Zoo and Universal Studios) and puts them together. Earlier this year, I was able to take my fiancée to the park and for her birthday present, we did something that we have wanted to do for a while now- we booked a Serengeti Safari Tour. If you have the extra money when you come to Busch Gardens and you love animals, then I highly suggest you take this tour. It runs around 35 dollars a person and is approximately 30-40 minutes long. 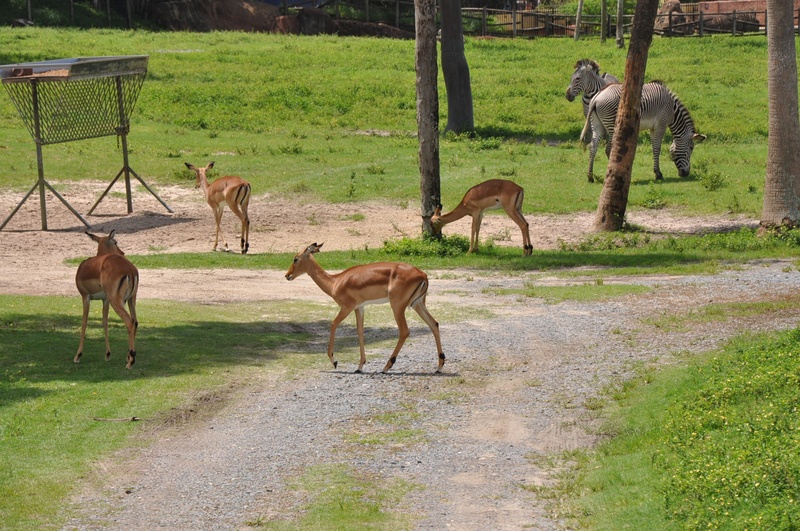 The basis of this tour is to get in the back of a large open jeep and go out into the plains area of Busch Gardens while someone tells you about the animals, but wait it gets better. 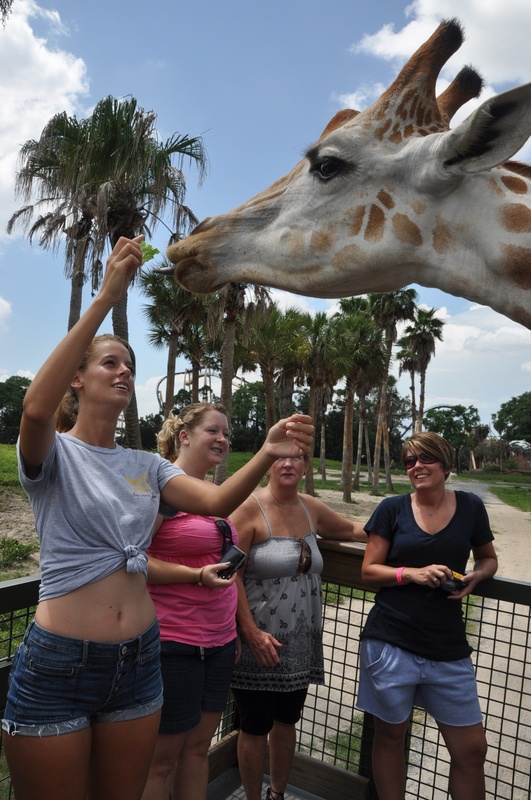 While you are out on the plains, you also get to feed the Giraffes. Now in most places that allow you to feed animals such as these long-neck beauties, you’re on the other side of a fence or other large obstacle and can barely reach the giraffe to feed it. However, in this case, the only thing between you and the animal is, well a jeep which in this case is next to nothing. See the pictures below for the proof. 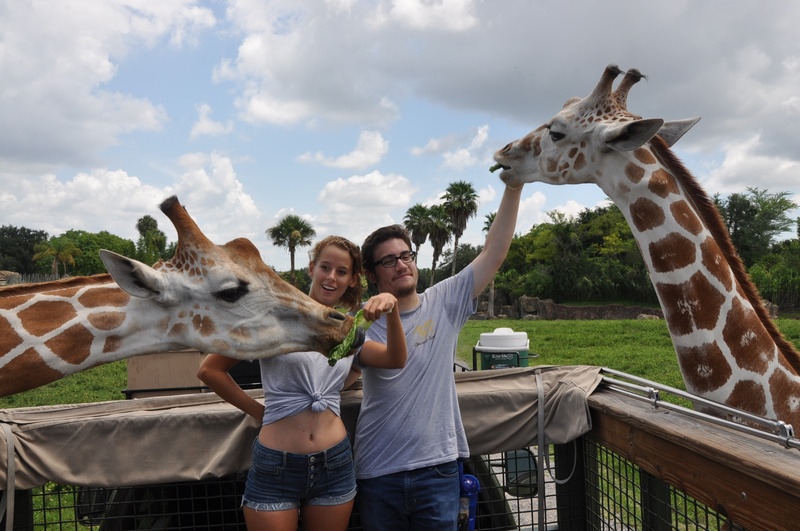 The Giraffes are close enough to eat from your hand, receive a hug from you, be petted, and of course if they want, use their long tongue to slime your face and hair. 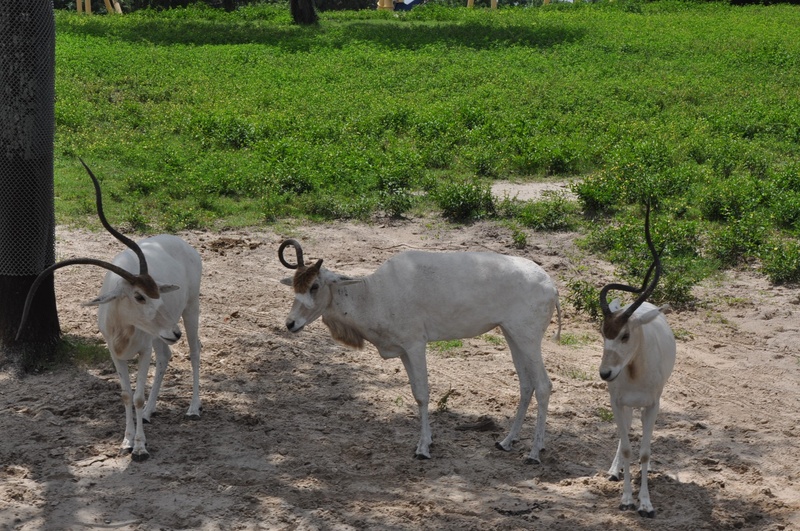 The safari tour was a wonderful and memorable experience for my fiancé and me as well as the other people who were on the tour with us. Getting to be so close and spend a good solid 15 minutes with the giraffes was amazing! You never fully can appreciate their size, beauty, and amazing qualities until you have a huge giraffe head beside yours and can run your hands along their short bristly coat, and get slimed by the impressive tongue. It was indeed a wonderful experience I would love to relive again! As if this amazing tour isn’t enough, Busch Gardens has tons of other tours that visitors can experience! Some of the tours take you behind the scenes in Jungala to see the tigers, some take you out to see the various endangered animals we have, and still others show you how the roller coasters work. No matter what you may like, Busch Gardens has a tour to fit your fancy…even one that can let you become an elephant keeper! 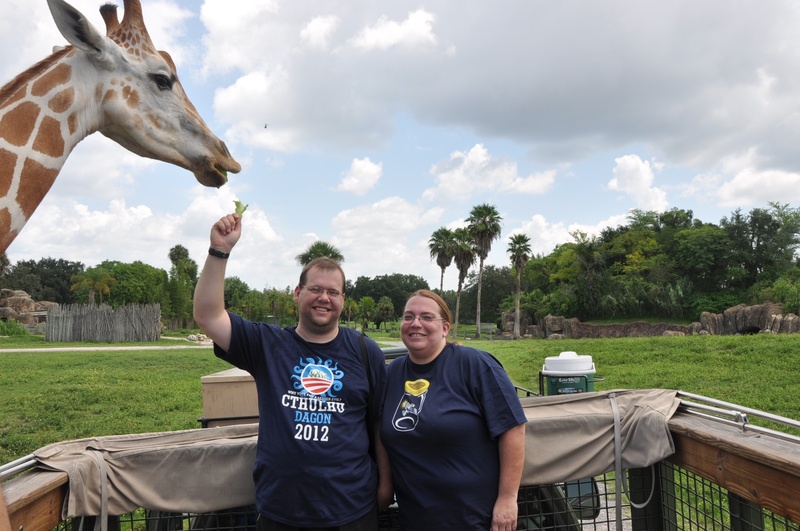 So get the family together or plan that special day all to yourself and head to Busch Gardens Tampa Florida and book yourself one of these amazing tours- you will be glad you did! In the real world, the 501st Legion is the world’s premier costuming group with their emphasis being the “villains” of the Star Wars universe. Many of the members are some form of Storm Trooper from the generic “These aren’t the droids we’re looking for.” Trooper seen in Star Wars: A New Hope to the Scout Trooper that piloted the speeder bikes on Endor in Return of the Jedi. Some also dress as the scarlet robed Imperial Guard, the Black Clad Tie-Fighter pilots, the bucket headed Death Star gunners and even the grey clad Imperial Navy personnel. Some even go for the Bounty Hunters such as Jango and Bobba Fett or Bosk. Some also pick a Sith Lord to take after such as Vader, Maul, or Sidious. The most wondrous thing about the 501st to me is their attention to detail for you see, to be in the 501st your costume has to meet such exacting standards that if they were filming another Star Wars movie you could basically walk onto the set and no one would blink an eye. While many would ask why dress as the villains, my first question upon learning about the 501st was “What do you do? Other than dress up in armor that is.” The answer may surprise many people, the 501st raises money for charity, visits hospitals to bring cheer to sick children and do general good deeds and spread good cheer wherever they go. The 501st makes appearances at conventions and parties and in lieu of payment as they do this out of the kindness of their plastoid covered hearts they ask only that donations be made to your favorite charities or to theirs if you don’t have a favorite. Several years ago I first learned of the 501st because of a youtube video about a crazy Japanese guy who would dress up as a Storm Trooper and dance in the middle of crosswalks while people crossed the streets. He was known as Tokyo Trooper and for the time that was all I knew of it. Here is one of his videos. It wasn’t until I first went to Ancient City Con in Jacksonville 4 years ago that I learned exactly what the 501st was. It was 2007, and ACC was only in it’s second year of existence. This was my first experience with a convention and I must admit even though it was a small convention, I was probably wide eyed with wonder. One of the first tables I saw and went right to was one that had a large banner proclaiming it to be the Imperial 501st Florida Garrison. What drew my attention, other than the banner with the Imperial logo on it, was the life sized replica of Han Solo frozen in Carbonite that they had hanging on the wall, the twin Storm Trooper guards on either side of the table, and a table full of blasters and armor pieces and even an alien head or two. I took one of their cards and made sure to look them up online when I got home. I even sat in on a discussion panel where a man dressed as an Imperial Admiral (or maybe even a Moff) told us how to do vacuforming and even how to make a cheap version of a vacuforming table at home with spare parts. As I told people about the cool Imperial 501st I started hearing more and more about some of the cool things they do and about another awesome video on youtube where a few 501st members created a spoof of the TV show cops. I of course had to check it out and thought it was quite funny, here is that video. Each year that I have been at ACC, the 501st has been there, and every year I watch the Storm Troopers walking around the convention and I think “Wow I wish I could get some armor and join them.” I always talk to the various members of the 501st that show up and get what information I can about them. I take pictures of them in their outfits whether it be as a Storm Trooper or even as a member of the Ghostbusters or a member of Cobra from G.I. Joe (yes many of them do several costumes and not always star wars related). In fact, this year one of them came in a very good Jason costume from the movie Friday the 13th. This year the 501st had their usual table but they also had a small corner of the room where they had set up a large picture similar in size to portable movie screen. The large picture was of a hallway of the Death Star. They then had taken two different Nerf guns and painted them and made some mods to them to make them look a little more Star Wars-ish. They then put one of the Storm Troopers in front of the picture and charged a few dollars for each gun and let people shoot the Nerf bullets that were tipped with suction cups at the Trooper. All of the money that was raised with this went to Wolfson Children’s Hospital, but don’t take my word for this, instead watch the video I took where they explain what they are doing and then of some people as they take aim and fire at the Trooper. All things said, if there was one group that I could join it would be this one- in a heart beat. Most likely I would try and get some scout trooper armor as I always fancied myself a good sniper in the videogames and I love their speeder bikes. Perhaps one day I’ll have enough money to get a suit of the armor or at least the materials to make it. I would love to attend a 501st Armor party and then become one of them. Ancient City con has been known to grow each and every year. Last year we were treated to the first year of concerts which was known as “CONtagius the Bard Virus” and featured two of my new favorite bands Sci-Fried and Consortium of Genius, both of which I shall talk about in a little bit, and the third band was Field of Glass. This year ACC stepped things up with “CONtagius the Bard Virus Two: Relapse” where instead of 3 bands we had 5. In some ways, I can be a bit of a snob when it comes to bands at a convention. What I mean by this is that if a convention is hosting your band and it gives you a table where you can sell your merchandise, it is a great perk and should be appreciated by the bands. However, if you don’t come by and sell your stuff then I start to think you don’t really care- about your work, your music, your band, and yourself as a musician. If you don’t care enough to try and get me to buy the music you worked hard on then I ask myself why should I waste my time and come to your concert? Last year I think this type of thinking worked out for me as I ended up seeing two awesome groups and ending up with 3 new CD’s for my collection. This year it may have backfired a bit as none of the performing groups showed at their tables on the first day; as a result, I did not go to any of the concerts. However, on the second day the band known as The Killer Robots did indeed show at their table and sold some CD’s and DVD’s. So this blog will be about my thoughts and reviews for The Killer Robots, Sci-Fried, and Consortium of Genius. The other bands this year were Goliath Flores, Shawn Lightfoot and the Brigade, My parents Favorite Music and finally Random Encounter. The other great band I had seen last year is Sci-Fried. Sci-Fried prides themselves on being the definition of geek rock and so far they seem to be holding tightly to that standard. With three fabulous CD’s out in their name I can guarantee that when the next one comes out I will be buying that as well as I foresee a long wonderful career for Sci-Fried. Sci-Fried has one album that is mostly spoofs such as the song “Too Many Zombies” based off of the Primus tune “Too Many Puppies”. Their other album is mostly original songs and their third and newest album Future Tense is a good mix of both original and spoof type music. Sci-Fried is a very talented group that has done metal, rock and even ska. Their website can be found here http://www.sci-friedband.com/. So if you are like myself and enjoy good music made by people who never forget who they are, what they stand for, and where they come from, then check out these and other amazing local and lesser known bands. Whether you are a geek music veteran like myself, or a newbie to the insanity like my girlfriend, bands such as these have something to offer everyone. So get out there, crank it up, rock out, and take over your own little corner of the world! Now that we have touched upon the panels that left a bad memory let’s move on to a better subject, the panels that we enjoyed! The interesting thing about this is that the panels we enjoy seem to be the same ones year after year and hosted by the same people year after year. So, without further ado, let’s dive right in. The first one we enjoyed was the “State of the Genre Address” hosted by Kevin Ranson and Brett Link of MovieCrypt.com. In this panel we were asked what we thought of sci-fi, fantasy, and horror in film, television, and online. We were asked if it was getting better or worse and why we though such. We focused a lot on the Marvel movies and their successes again and again lately compared to the DC movies that have some movie goers up in arms (the movie pointed out most was Green Lantern as a fail though I have yet to see that one.) Other questions that arose were things like why is Sci-Fi Friday now filled with 2 hours of wrestling when it used to be the day for major sci-fi shows on SYFY. All in all it was an enjoyable panel that got us talking and thinking about why some things are good and successful and others perhaps not as much. The next panel that we had enjoyed was hosted by the same people as the “state of the Genre” panel; this one, however, has been a favorite of mine for the past few years. It’s the “Ultimate Occult Showdown”! The reason this panel is sooooooo much fun is because audience participation is required and mandatory and if you don’t speak up they WILL call on you! The premise of this panel is that they will take 2 characters or teams or creatures and say something like “Who is the better demon slayer and why Angel or Constantine” or “Who is hotter and why Buffy or Agent Scully”. At this point the people of the audience call out who they would give a point to and why, the reasons get discussed points get added or subtracted at Kevin and Brett’s discretion and eventually we have winners for each category. The one unfortunate point this year was a lot of us at the panel lacked TV this year so many of the comparisons were ones we just sat there mystified about. At points like this, to get at least some points going, Kevin to the laughter of us all would pick up the megaphone they had and go into the hallway and ask the question of the other con goers who were not in the panel. As I said audience participation I required, even if you didn’t know you were part of the audience! Another panel my girlfriend and I attended and enjoyed a great deal was held first thing Sunday morning, the“Building Better Characters” Panel which was hosted by Linda Cowden author of Grimmie, Kevin Ranson author of The Spooky Chronicles, and T.S. Robinson author of Into the Dragons Maw, Mirror of Opposition and Battle Chasers. The great thing about panels like this is the ability for aspiring authors like me to pick the brains of the ones that are already where I want to be one day. Also, the authors that Ancient City Con tend to get are very nice people who love to help aspiring writers in any way they can. We got a lot of really good information from this panel about how to create good characters and how to flesh them out. The last one we are going to talk about is the “Future of Publishing” panel. This was one that was very interesting for my girlfriend and I. After all if we want to be writers we have to know how to get published one day. Some of the topics touched upon were, E-book vs. Paper book, self publish vs. publishing house and do we really need bookstores or are conventions the better choice. Like the previous one mentioned, this was hosted by Linda Cowden and Kevin Ranson and had a lot of good information. However, the first ten minutes were taken up by the previous panel (Fanfiction to Fiction) since the man from COO-IE didn’t pay attention to time. Thankfully, Linda and Kevin took another ten minutes or so of their time to talk to us about things that they and us both did not agree with in that panel. These panels were a great opportunity to grown and learn and network; my girlfriend and I gained a lot of wonderful information at this year’s con. Now, our job thankfully is simple- share it with others, which is what we are going to be doing. More ACC blogs to come soon so stay tuned! I have to say that this year at Ancient City Con, I enjoyed quite a few of the panels I went to and most were very enjoyable. However, this was not always the case. In fact, there were 3 panels that have really stuck in my mind; unfortunately, it’s not because they were the ones I enjoyed. Did they have some good information? In some ways yes, but no matter how good the information was, there were things in each panel that just soured these three for me. The panels I will be speaking of here were the “Self-Serve: Using Blogs and Bloggers for Promotion”, “Folkloric Analysis of Anime” and “Fanfiction to Fiction”. First was“Self-Serve: Using Blogs and Bloggers for Promotion”, as I was on the verge of starting the very blog you are reading,I figured this panel would be a very good one to attend. Unfortunately, I really only got one good piece of information from them in my opinion. That piece of info was simply this: To get more hits on your blog, go to like minded blogs and post comments and network with fellow bloggers. This was about where the panel ended as far as being useful it seemed. They talked a lot about their own blogs, they stroked each other’s egos as they recounted different blogs they did and how each of them had commented on each other’s blog and thus led to more blogs. But in the end, they really didn’t tell us much. The biggest problem I had with their panel ,however, was that each of them review books BUT they all refused to review self published books. The reason for this they claim was the fact that the most self published books were horrible. What makes this so insane when you think about it is simply this, at ACC 99% of the authors who show up are self published or have been self published at some point and time. I have bought several books over the past few years from the authors at ACC and I have yet to find one I did not enjoy. These bloggers are seriously missing out on some good books by limiting themselves to reviewing only the so called ‘good authors’ who are simply good because one person in some publishing house somewhere liked their work. That would be akin to me no longer reading the Star Wars books simply because I absolutely hated the two novels that Barbara Hambly added to that universe. However, I stuck with Star Wars and I am glad I did because the other 99% of the books havebeen amazing. I would love for one of these bloggers to pick up William Hatfield’s book “Captive Audience”, or Linda Cowden’s “Grimmie” or “Mirror of Oposition” by T.S. Robinson , or even “Bitten” by K.L. Napier. Perhaps one of these books could help to change their minds. Then again, with people who are that closed minded, perhaps I don’t want them to read the books that I see as treasures; I would hate to see them sully them with a short sighted review. The second panel was “Folkloric Analysis of Anime”. This panel had the possibility of being REALLY cool. It was run by a guy who was visiting the con with a company called COO-IE. However, for all of its possibilities this panel was a bomb right from the start. It started with malfunctioning AV equipment, and trying to get that fixed took up at least 15 minutes of the panels 1 hour time limit. Once he decided to continue and tell us things from a mixture of memory and what he could just read off of his laptop screen to us, we found out that this panel was going to be as bad as a college lecture. To say this guy was dull would be an understatement. He gave us some information about ways to classify folklore by simply rattling off the number from one particular database and then telling us what it was. For instance he would say a number, such as “grid number 33”, and then say something like “Hero calls creature from an object to fight in battle for him.” He then pointed out the similarities to pokemon and then starts spouting the next number. He also had another way of taking fairy tales and putting a number value to each part; perhaps this would have made more sense with the visuals he had planned, but I have my doubts. When Cinderella starts looking like an algebra equation is when my mind starts to shut off. By this time he asked for questions, but thanks to the time he took fooling with the AV equipment we had maybe 3 minutes to try and turn our brains back on and ask him something. Needless to say most of us simply got up and walked out of there looking like a zombie from “Night of the Living Dead”. Now please do not think that I am bashing panels and was terribly disappointed with the panels. For the most part, I found the panels at Ancient City Con to be very informational, entertaining , and enjoyable. It was just these three panels that really left a bad taste in mine and my girlfriend’s mouth. But rest assured, we will be writing about the other wonderful panels that we enjoyed very soon, so check back and relive the best and most interesting panels of ACC!